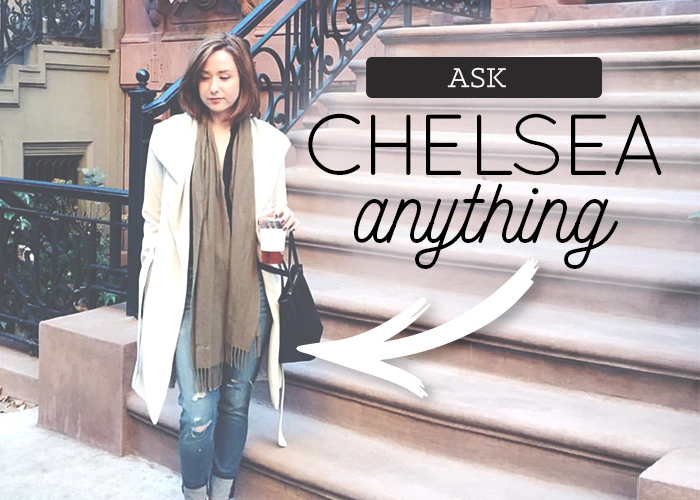 Hello and welcome to this week’s Ask Chelsea Anything, which is a very special one, because it’s starting with a follow-up to a recent ACA. The other day, I got an email from the reader who had sent me in a question about her friend, who was in desperate need of a financial intervention. Being that I have been on the receiving end of a few in my time, I advised her on the best way to approach this friend and how to phrase her concerns in a way that might lead to something productive, instead of just an alienated friendship. As it turns out, the advice worked out very well for her, and — with her permission — I thought I’d share what she told me in her most recent email. I took your advice and invited her over for a wine and cheese night (and kicked my boyfriend out so it was just the two of us). She actually made one of her “jokes” about over-spending fairly early into the evening, which provided the perfect segue into me expressing my concern. She seemed so genuinely relieved when I brought it up–like she was just waiting for someone to call her out on her spending so she could have a chance to talk about it. You were exactly right. I didn’t realize that she was so unhappy with so many aspects of her life and was spending to compensate and momentarily feel a bit better. We ended up having a great talk, and, yesterday, she told me about her plan to pay down her credit card debt. I’m sure it will be a long road, but it’s so great to see her feeling empowered and turning over a new leaf. I’d encourage anyone who is currently thinking about staging a financial intervention of some kind on a friend to read the full post (linked above), and to remember that at the end of the day, what we need most from the people we love is someone who actually cares and wants to be there to help throughout the whole process. Ignoring someone’s issues to preserve a friendship is no more loving than callously judging them. Getting serious about a friend’s problem is hard work, but ultimately — if we want friendships that are meaningful and honest — worth it. So, without further ado, this week’s Q&A! I am 20 years old, and a full-time student at my local university. Just over 2 months ago, I saw an ad for a part time position working 15 hours a week, and in a very official field. I applied thinking there was absolutely no chance of even getting an interview, but my mum pushed me to apply (bless her). Needless to say not only did I get an interview, 3 weeks later I was offered this (somewhat) prestigious job. Not only was it in my dream field, it has a salary (19K a year) which is the most money I will ever have made in my life so far. Most of the people in my life have been incredibly supportive, and I have being getting offered congratulations from everyone. I feel incredible blessed and appreciate the situation I am in. Prior to this, I was working up to 6 different part time jobs, everything from retail, to tutoring, to mentoring plus I was (and still am) involved with several different volunteer student groups and initiatives. In addition, I was still studying full-time towards my two degrees. I didn’t consciously realize that I was building a résumé that not only looked very extensive for someone of my age, but was also incredibly diverse. I was, and still am, working very hard, I just didn’t really realize it at the time. I feel like all my 14 hour days have finally paid off. But one of my best friends has being making some comments which are not so supportive. A while ago we were out to dinner, and he kept making very snarky comments about my new phone (which I brought as my job requires it), and my manicure (which my mum paid for as a congrats for getting the job). He ‘jokingly’ claimed that I have changed, and even went so far as to say that I am acting like a snob now. I know that he is in a financial position that is not neccesarily easy, and I completely understand that (having been there myself just prior to getting this job). But I have no idea how to cope with these sort of comments. I don’t want to apologize for my “success” or say I just got lucky, cause I at least feel like I worked somewhat hard to get here. I feel like these comments have undermined my whole perception of this job. But I also don’t want to make people feel uncomfortable or upset. I don’t want people to resent me, especially my best friend. Ah, yes, the unsupportive loved ones in the face of personal achievement: one of the biggest downsides of pretty much any kind of success. And I say this not just because it tends to happen, in some form or another, throughout most of life’s big moments, but because it’s important to remember that there are always downsides to this kind of thing. Nearly everything good we get in life, particularly when it brings significant change, is going to involve something that makes us uncomfortable. This could be anything from working much more than we’re used to, to feeling overwhelmed, to having people around us who are made to feel less-than-great about our news. It’s not objectively a good thing that achievements come with some kind of asterisk, but it’s not a bad thing, either. It’s important to temper our excitement with a good amount of humility, perspective, and hard work, and this is one of the things that’s going to take your great news into the realm of reality, and make you a better and more mature person in the process. All that said, it’s important to remember two things: you deserve to feel proud of yourself (and to not feel guilty), and you deserve respect from the people you love and respect yourself. It’s unfortunate that other people have not yet made the transition into a more stable and prestigious/financially-comfortable job if that’s their goal, but that doesn’t mean that you took something from them by doing it yourself. While you should never belittle someone for not having a certain kind of job — or believe that they are somehow less deserving or assume they work less hard than you do — you should also not look at your own professional achievements as somehow being against anyone. We can be happy and proud about our own successes without looking down on anyone else, or making inferences about their capabilities (which is what society often does when someone is working multiple small jobs instead of one “big” one). As long as you are being respectful and kind to this friend, you have absolutely no reason to feel guilty about your new position in the professional world. Feeling proud of your résumé and how hard you worked to get to where you are is important, and someone else’s personal journey shouldn’t temper that. But getting over the unfounded feeling of guilt is only the first step — the second is demanding that the respect you are giving your friend is reciprocal, and that’s the more difficult part. Now, does this mean that your friend might never have sour feelings or envy about your success? No, he’s human and probably not in control of a lot of what he’s feeling. (I’d venture to guess that he doesn’t feel particularly great when he makes these comments, and probably regrets them immediately after he says them, because he knows that taking his personal issues out on you only creates more problems.) But someone can have feelings they deal with on their own, or even talk to a trusted third party about to vent or seek advice, without having to throw it in your face. Making snarky, subtly degrading or hurtful comments is a very strategic thing, and it nearly always comes from a place of envy or insecurity. It’s a way of taking something from your success, to make themselves feel less of a chasm between where you both are, respectively. I’ve dealt with it through my writing career, nearly everyone I know has experienced some form of it, and I have even been the person to make snarky comments when I was in a more insecure place in my life and was threatened by what someone else had. It’s an ugly thing, but it’s very human, and it can be overcome. This means that you have to tell him, honestly and clearly, that these comments are hurting your feelings, and that if he can’t stop making them, you can’t see him until things cool off a bit. These boundaries are totally fair and healthy, and don’t make you a bad person for setting them. I’d recommend either a private one-on-one, or, perhaps easier, writing an email/letter so you can gather your thoughts in as clear and non-accusatory a way as possible, and give him time to consider it on his end. It’s almost certain that he knows what he’s doing, but doesn’t think you’ll say anything because you a) don’t want to risk awkwardness/tension, or b) feel guilty. Both of which seem pretty true at the moment. Part of growing up, though, is deciding how you deserve to be treated and doing the work required to be treated that way, even if it means having a mature-yet-frank conversation. There have been people I’ve more or less removed from my life because they were truly not happy for me/didn’t have my best interests at heart, but they were also not super-close to begin with. But I’ve also had closer friends with whom I felt this tension, and I had the hard conversations. For example, when a good friend didn’t buy my first book a few years ago, I told her that it hurt my feelings, and we talked it out from there. I had a knot in my stomach bringing it up, but I’m glad I did, and we’re better for it. And when another friend told me that my snarky comments about her college of choice — which I was frankly jealous of at the time — were hurting her, that was a wake-up call for me. Insecurity, especially over things as socially important as our careers, is something no one is immune from. If we care about the people hurting us, we owe them a chance to make it right in an adult way, but that means we have to say something. Sweeping unkind behavior under the rug only hurts both of you, and cheapens the friendship. You are starting a new chapter of your life now, as an adult with much more responsibility and a bright future — your personal life should reflect that, and the first step is standing up for yourself.